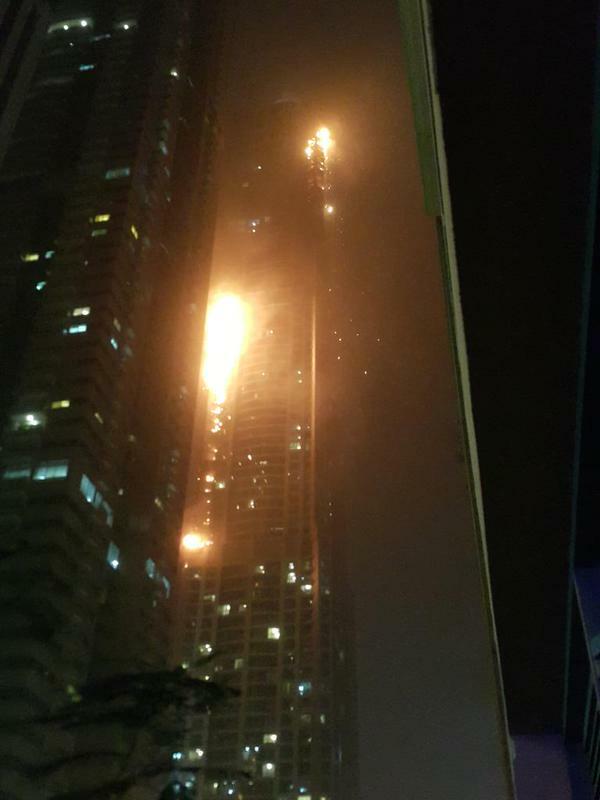 A massive blaze has engulfed the ‘Marina Torch’ skyscraper in Dubai, forcing hundreds of people to flee the 336-meter-high tower – one of the tallest residential buildings in the world. It took firefighters over two hours to bring the fire under control. The fire initially started in the middle of the tower, rapidly spreading across some 15 floors, intensifying and reigniting with each gust of wind, according to photos and videos from the scene. Thousands of people were evacuated from the tower and surrounding buildings as fire-fighting crews and police have cordoned off the area. As the fire spread, chunks of the facade began falling down. Firefighters on the ground were extinguishing the debris and pieces of molten glass that had fallen from above. The scene of a colossal building in flames was reminiscent of the “Titanic going down,” a witness told the Dubai-based Gulfnews paper. Police and medics on the scene said there were no fatalities or serious injuries. Many people evacuated from the building, however, have suffered from smoke inhalation, according to Gulf Business. Strong winds had hampered efforts to beat back the blaze on the top floors of the building, and it took fire crews over two hours to bring it under control. The fire alarm went off shortly after 2am, according to a tower resident, who said it wasn’t the first incident over the past few weeks. Shortly before 5am local time the cordon was lifted and residents living on the lower floors of The Torch were allowed to return to their apartments. This entry was posted in Jafria and tagged Dubai, Fire, Residential, tallest building in the world. Bookmark the permalink.